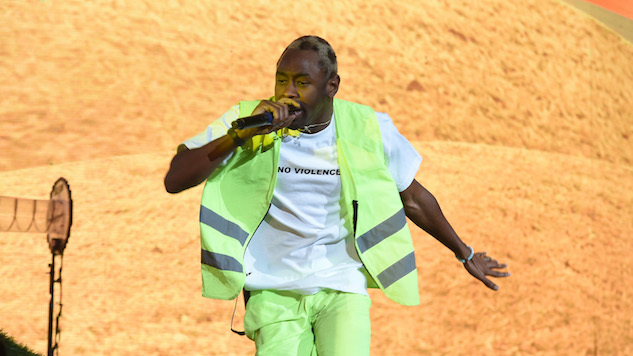 Tyler, the Creator Brings Us to the Studio with New Track, "435"
Tyler, the Creator is a tinkerer. His work is often collage-like, tackling mismatched material under a lens of surprising cohesion. Constructing songs from his disparate sources can end up messy, though—Tyler seems to know this, and has lately taken up the habit of culling tracks from his own library and feeding them to his fans. A newly released track, “435,” follows a series of other “throwaway” tracks like “OKRA” and “Rose Tinted Cheeks,” all released this year alone. In the video for “435,” Tyler is followed by a one-take shot as he raps along to the track. Filmed by frequent collaborator Luis Panch Perez, the recording is casual, bringing Tyler’s fans along into the studio. A classic beat thumps underneath Tyler as he moves across the room, a sound that veers away from his typical experimental grooves. In a tweet, Tyler noted, “this is not an indication of how future things will sound.” He also revealed that the video was filmed earlier this year in Philadelphia while on his Flower Boy tour. We’ll continue to be on the look out for any new tracks by Tyler after this year’s fourth release. Until then, check out “435” below.